Hello readers. Sorry I haven’t updated the blog in a while…been really really busy. Sorry hate starting a blog post that way. Any who…I have been noticing a little trend and it involves the way in which people are combating the recession in innovative and creative ways. Here are a few of my favourites…I hope you like them. The Marmite pop-up shop is located on Regent Street and will be open seven days a week during the run up to Christmas. 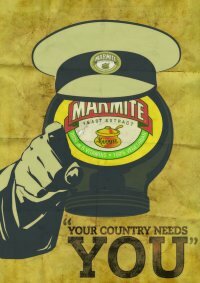 The store will stock more than 100 Marmite-inspired products, some of which will be sold there exclusively. As a huge marmite fan the concept I feel is both creative and intriguing. I have not had the pleasure to visit the store yet, however I am told that it is a two tiered store with a Tea and Toast bar upstairs. Products include food, clothes, artwork and Christmas boxes. I really like the idea of a pop up shop (semi permanent not just a table outside a supermarket), as it places the brand in an ideal location and is also cost effective. Could this strategy be adopted by more brands if this turns out to be a success? Okay so I have said it before but Google Street View is a great tool….and if used in the right way can be very powerful. I have talked before about the use of it by the Editors (https://tomgooday.wordpress.com/2009/10/15/google-street-view-mashup/) with their Google Street View Mashup and I think both of these examples are pretty cool. The Coronation Street example above, can be found here http://www.itv.com/soaps/coronationstreet/mycorrie/googlestreetview/ and I think it is a great way for fans (sorry I am not one) to interact with the location. I could see my mum sitting down and virtually traipsing up and down the street to see if you can pick out peoples houses (mainly because she is nosy) but also as it interests her. This made me chuckle and I in turned passed the video onto countless friends via Twitter and Facebook. Many companies seem to be trying to jump on the Viral bandwagon with varying success…more examples to follow.